The Lodgy MUV is Renault’s attempt at making a mark in the premium seven-seater segment that is being ruled by the Toyota Innova for more than half a decade now. Where most of the Innova’s rivals failed for reasons like brand value, ownership cost, ‘taxi image’ and even looks, we try and find out if the Renault Lodgy stands a chance with the claimed modern underpinning, better performance and extra cabin space. Instead of a in your face profile, it gets a rather smooth design on the front with petite headlights just around the front corners with a strong chrome line forming the hood lip joining both the headlights. The twin slat grille flows horizontally around the solid Renault logo placed at the centre. The front bumper gradually flows out from the headlight giving it a car like design. It also gets a two tone finish with the lower portion finished in matte also forming an air splitter and fog lamps housing. The chrome touch given all over looks decent. The uniformly straight flowing roofline makes it look like a typical family carrier but at the same time it looks way better than Nissan Evalia and Chevrolet Enjoy. Large windows for all three rows make it look impressive as well as serve for a roomier feel inside the cabin. The wheel arches gets a subtle flair and the 185/65 R15 tyres with five spoke solid alloys suit the large contours. To make sure the silhouette doesn’t look drab, the Lodgy gets crease lines on front and rear sections. There are chrome protectors on the lower section. The rear quarter view looks as impressive as the front quarter with swollen sections and solid profile. The fish tail styled tail lamps is a nice attempt to distract from otherwise boring looking tail door. It gets roof mounted brake lamps and a large rear windshield. There is again solid chrome above the number plate area as well as on the lower section of the tail door. Overall, the rear profile looks clean and scores more points than many other MPVs excluding the Honda Mobilio, which has the best tail door design. Now this is where the Renault Lodgy really comes into its own. It is nearly 4.5 metres in length, it has a reasonably high roof, and it isn’t exactly short on width like the Honda Mobilio or the Maruti Suzuki Ertiga. So interior room on the Lodgy is fantastic. Be it leg or elbow room at the front; knee, shoulder and head room in the second row; or even the knee and shoulder room in the third row; the Lodgy has enough and more all round. This one is a proper seven seater even when you consider adults. But this is true only for the version that gets a bench in the second row; officially classified as an eight seater. Renault says the Lodgy can seat three in the last row, and so we tried. But unless all three are size zero adults, it’s an uncomfortable squeeze. For two, it’s great. Flexibility to haul luggage though is just as Renault claims. With all seats in place, there’s enough space for small sized suitcases (over 200 litres). With the last row folded, the Lodgy can easily gobble up weekend luggage for five. And when you throw out the last row and fold the second, you can literally move houses with this car. Now, this is the top of the line RxZ trim. The Lodgy will also be available in the mid level RxL and the entry level RxE trims, the detailed feature list for which will only be revealed later. For the RxZ, its interiors might look different from the one on the Duster, but there’s still a lot of parts sharing here. The steering wheel, the front aircon vents, the gear shifter as well as buttons and knobs be it for the aircon or the power windows or even the ORVMs, are all from the Duster. The touchscreen multimedia system is taken from the Duster as well. So, the overall quality levels though not all that great, still suffice. But not having climate control or ORVMs with turn indicators is a miss. The Renault Lodgy in the RxZ trim also gets steering column mounted audio controls, Satnav, and aircon vents for all three rows besides ABS and front two airbags on the safety front. 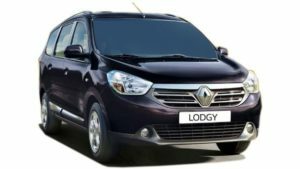 The Lodgy is powered by the same tried and tested 1.5-litre dCi diesel engine, carried over from the Duster, offered in two states of tune – 110 PS/245 Nm and 85 PS/200 Nm. It won’t come with the 1.6-litre petrol engine though. The 1.5-litre oil burner is a gem of an engine that we have tested in various cars before. It is quite a refined motor with stellar NVH levels, fuel efficiency and tractable power. The engine behaves the same in the Lodgy, pulling the MPV in a strong yet linear fashion. There is the typical turbolag under 2000 RPM with the 110 PS version, which is not present in the 85 PS version. The car has a punchy mid and top-end power that makes it a confident highway performer. The diesel clatter is not intrusive in the cabin but gets a little vocal near the redline that comes at 5000 RPM. 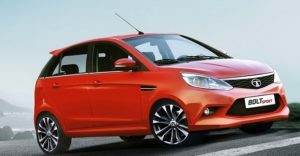 The 110 PS Lodgy is mated to a 6-speed manual transmission while the 85 PS gets a 5-speed gearbox. Gear shifts are smooth and slick but the 110 PS has a heavy and snappy clutch, which can get annoying in stop-go traffic. 100km/hr in the 6th gear sees the needle ticking around 1900 RPM, which makes cruising quite relaxed. The 110 PS version does the 0-100 km/hr sprint in 12 seconds with a top speed of 170 km/hr and the 85 PS does it in 13.3 seconds having a top whack of 163 km/hr. The French automaker claims that it has the best acceleration and top speed in its category. The ARAI fuel efficiency figures for the 110 PS and 85 PS Lodgy are 19.98 km/l and 21.04 km/l respectively, take them with a grain of salt though as real world mileage will be at least 4-5 km/l lesser. We only had the 110PS being offered to us for the test drive. The engine is familiar and its torquey performance straight away feels like the right match for the Lodgy. Both in city traffic and highway speeds, there is more than enough juice from the engine to make use of. There is a bit of lag, but once the needle passes the 1,400-1500rpm level, dollops of torque kick in. We are not sure, how responsive the engine would feel in its 85PS avatar, especially if the Lodgy would be fully loaded with people and luggage. Renault seems to have wiggled into a sweet spot in the crowded MPV market with the Lodgy. It blends space, comfort, good driving dynamics and strong performance into a convincing package. As a family car, this MPV is hard to beat. It makes for a happy companion, especially on holidays, thanks to its unmatched cruising ability and long fuel range. It&#8217;s not all perfect though. The quest to liberate as much room as possible has made the Lodgy a touch too boxy, which could be a deal breaker for some. Also, at Rs 11.79 lakh for the top-end RxZ 110 diesel, it is on the pricier side. However, you do get a fair bit for your money, which makes the Lodgy reasonable value too. The only real issue is, Renault&#8217;s service network doesn&#8217;t as yet cover the entire length and breadth of the country. But the Lodgy&#8217;s proven mechanicals, which are shared by the Duster, should give owners peace of mind. The 2017 Mercedes-Benz SLC-Class hardtop roadster is offered as an SLC300 with a 241-hp, 273-lb-ft of torque turbocharged I-4. The higher-performance AMG SLC43 is powered by a 362-hp, 384-lb-ft of torque 3.0-liter twin-turbo V-6. Both engines are mated to a nine-speed automatic that sends power to the rear wheels, as a roadster should. The SLC300 returns an EPA-rated 25/32 mpg city/highway while the AMG SLC43 delivers 20/29 mpg. Mercedes-Benz claims a 5.8-second 0-60 mph time for the SLC300 and a quick 4.6 seconds for the AMG SLC43. The retractable hard-top operation must begin when at a stop but can continue at speeds up to 25 mph. The 2017 SLC’s DYNAMIC SELECT system modifies the engine, transmission, steering, and suspension at the touch of a button and comes in five different modes: Comfort, Sport, Sport+, Eco, and Individual. The available Dynamic Handling package features an adaptive damping system and ESP Dynamic Cornering Assist that continuously adjusts the damping force at each individual wheel depending on the current driving condition. The available AMG Handling Package on the SLC43 includes an AMG limited-slip differential, AMG Performance steering wheel, and red brake calipers. 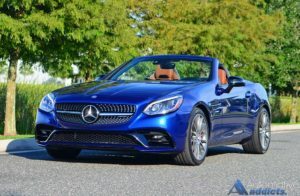 Mercedes – Benz AMG SLC 43 gets a sleek face and features the vario-roof, which is the folding hard top that was used in its predecessor as well. The top can be opened and closed with a speed of 40 kmph. The vehicle gets an AMG-specific front bumper along with a rear bumper that looks like a diffuser. There is a diamond radiator grille with chrome finishing. Mercedes – Benz AMG SLC 43 features LED headlamps and overall, the car has a more rounded profile when you compare it with the previous SLK model. The interior received less attention with the facelift, as most design features are identical to the SLK55. Notable changes include a new steering wheel, a revised instrument cluster, new seats, and silver chrome trim finishes for the A/C vents and door handles. Wrapped in Nappa leather, the multi-function steering wheel comes with a flattened bottom and perforated grip areas for the hands. The seats are said to offer greater lateral support when a dynamic driving style is adopted. As usual, numerous upholstery layouts are available, with the range-topping models getting a combination of Nappa leather and Dinamica microfiber with contrast stitching and piping for the seats, door panels, steering wheel, and upper dashboard. The Airscarf neck-level heating system introduced on the S-Class Cabriolet is available as an option. The Comand infotainment system is also an option, as is the Logic 7 Surround Sound system by Harman Kardon and ambience lighting in Solar Red, Polar Blue, and Polar White.Overall, the SLC43’s interior doesn’t offer too many new features, but it’s not bad for a mid-cycle facelift. Aah, onto the big changes. Chiefly, the naturally aspirated V8 on the SLK 55 has made way for a smaller, twin-turbo, 3.0-litre V6 unit on the SLC 43. The new engine makes 367hp at 5,500-6,000rpm (down on the SLK 55’s 420hp) and 520Nm (down on the SLK 55’s 540Nm). All the power makes its way to the rear wheels via Merc’s new nine-speed gearbox which comes in place of the SLK’s old 7G-tronic unit. The engine’s two turbos and gearbox’s two additional gears help the SLC 43 make good any power deficit vis-à-vis the SLK 55. Coming to performance, 0-100kph takes 4.7 seconds (claimed) which is just a tenth of a second off the SLK’s time. However, the turbo-charged SLC is a whole lot faster through the gears so real-world performance is actually better on the SLC 43. You don’t have to wind the bi-turbo engine to get to its best. There’s strong punch from low down in the rev band and you get that push back in your seat pretty much as soon as you weigh down on the throttle pedal. What helps is that the SLC 43’s gearbox works really well with the engine. It’s lenient enough in automatic mode, responsive to tugs at the paddles and then you have the option to go to full manual mode and slam an upshift at the 6,500rpm limiter. Like the SLK55 before it, the SLC43 still rides the line between a sports car and a quick GT roadster. Ultimately it leans more toward the latter than the former not only because of its mass, but overall tuning as well. Still, efforts have been made to produce a livelier chassis for those interested, with optionally available adaptive dampers offering a choice between ride compliance and flat cornering. The aforementioned handling package adds a mechanical limited-slip differential to the mix, which works in conjunction with added negative camber at all four corners, newly developed front and rear axles and revised engine mounts.Scrolling through the five drive modes on offer through the AMG Dynamic Select button on the center stack further illustrates Mercedes-AMG’s effort to provide an accessible and relatively docile roadster during everyday driving, and a red-blooded performance car when called upon to act like one, particularly when Sport+ is selected. As for safety, the Mercedes-AMG SLC 43 gets ABS, priming and brake drying function, hill start assist and hold function. It also gets six airbags in total along with other features like acceleration skid control, crash-responsive head restraints and pre-safe system with reversible belt tensioners. Whenever emergency braking is detected the brake assist system with brake servo assistance help with effective braking.The feature loaded Mercedes-AMG SLC 43 gets Dynamic Select function which offers five selectable drive modes – Eco, Comfort, Sport, Sport+ and Individual. The roadster also gets the AMG sports suspension system that makes it a sheer impressive performer. The infotainment system supports Apple CarPlay and Android Auto system. Moreover, the Garmin MAP Pilot makes navigation an easy task. Although some may feel disappointed by the fact that the SLC43 didn’t receive AMG’s new 4.0-liter V-8, the revised roadster remains one of the most thrilling performance vehicles on the market even with a V-6 under its hood. AMG’s decision is understandable here, as the SLC’s current platform isn’t suited for the new engine. The 4.0-liter V-8 will most likely find its way into the SLC with the next generation, but until then you’ll have to settle with the 3.0-liter V-6. Hopefully, the revised underpinnings will make the roadster sportier than ever before and customers will quickly forget that the engine packs only six cylinders. If you are a millennial, this is the time to start investing in stock markets. Why? With a new job and a fat pay cheque every month, you feel richer with every spend you make. A credit card or personal loan is not the way out. As your spends stack up, you lose your way in the financial jungle. Let us show you a way out: ride the Bull to emerge a winner. If you are still wary of investing in the stock markets, consider this: the Sensex and Nifty have risen by almost 13-18 percent so far in 2017. They are now correcting, as they continue to struggle with GST, a weak economy and poor corporate results. That, however, should not dishearten you; this dip in stock markets is just the time to begin and what better occasion than Diwali? If you think it’s too early to start investing in the capital markets, think again! The ‘early bird’ adage is apt for millennials eyeing the market. Assuming you are 35 years old, let us assess how delaying investments affects you. If you had started investing Rs 2,000 a month at the age of 20, in an equity mutual fund (growth plan), your current corpus would have grown by five times to Rs 17.8 lakh, on an investment of Rs 3.6 lakh. By contrast, if you had started investing the same amount in a similar fund at age 25, the delay of five years would have shrunk your corpus to Rs 5.79 lakh, on an investment of Rs 2.4 lakh. Thus, the earlier you begin, the better. If you are a beginner, opt for a host of mutual funds — diversified equity funds, debt funds and balanced funds. If you need money at short-term intervals, you can opt for liquid funds that offer better returns than FDs and allow easy redemption. Mutual funds are an easier way of investing in equities, as they spread your investment (and risk) across a range of stocks. For higher returns, you could try investing in direct equity. “Young investors with a better risk appetite can easily park bulk of their savings in equity, either through the mutual fund route or through direct equity. If you are looking to create wealth in the long term, you can benefit from Sharekhan’s offerings such as Top Picks and Power Portfolio. Top Picks comprises a set of 10-12 well-researched companies with sustainable businesses, in which you can invest a lump sum amount at one go and start an SIP, simultaneously. Similarly, Power Portfolio is a basket of stocks — mostly large-caps — that are actively managed. Both Top Picks and Power Portfolio have consistently outperformed benchmark indices,” says Gaurav Dua, Head – Research, Sharekhan. With initial public offerings (IPOs) headed for a record year in 2017 — total issuances are estimated to cross USD 5 billion mark this year — it is natural that you are prompted to try your luck with every issue. However, the success or failure of an IPO does not depend solely on the listing day gains. You must study the draft prospectus carefully, keeping an eye on three things: the issuer’s business model, its debt levels and its past financials. Overall, this may be a good time to take a plunge in the stock markets. Focus and consistency may yield the pearls that you hope for. streak and thus aptly called the Tata Bolt. Zest and now in the Bolt. spacious cabin, the Bolt doesn’t share much with the Vista. well-known quality niggles still persist. and the ‘Multi-Drive’ row of buttons which are set too low. Bolt’s seats consistent foam density. percent smaller than the Vista’s. great; most customers won’t be tempted to spring for an audio upgrade. wait for a date closer to the launch next year. movement due to the tall seating position. there is some body roll. car you can actually have some fun driving. the same is reflecting already although such things take time. Motors has once again got it right with the Bolt. Tata Bolt Ex Showroom Price in New Delhi ranges from 4,63,449/- (Bolt XE Revotron 90PS Petrol) to 7,16,908/- (Bolt XT Quadrajet 75PS Diesel) .Tata Bolt has 8 Variants of Petrol are available in India. Tata Bolt comes in 5 colours, namely Venetian Red,Platinum Silver,Sky Grey,Pristine White,Dune Beige.